Scotty Smalls moves to a new neighborhood with his mom and stepdad, and wants to learn to play baseball. BEFORE: I apologize for a lack of film yesterday. It was an unscheduled day off due to a large backload of school work I needed to get through. I had actually written quite a lengthy paragraph on how I wasn’t going to be altering the baseball chain for anything, but obviously, that plan is now scrapped. 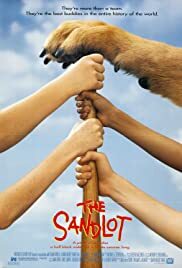 Anyway, next up on the baseball chain is The Sandlot. I don’t know much about this film other than it’s seen as a classic baseball film. It does feature James Earl Jones who will appear in Field of Dreamswhich will probably be postponed to later this month along with Bull Durham. AFTER: The key piece of this film is the voiceover. It constantly pops in to provide exposition and let the viewer know what is going on, on the screen. Voiceover can be very effective in some films. Titanic is an obvious example that comes to mind. Sad to say, The Sandlot struck out on this account. Now this isn’t the only part of the film. The Beast is another major component along with the social issues Scotty Smalls (Tom Guiry) deals with throughout the movie. But I could not get past the problems with the voiceover. It’s actually done by the writer and director, David M. Evans, and with all due respect, he does not have the voice to narrate. It doesn’t have to be a Morgan Freeman voice but it should be at least a little less amateurish and more sonorous. The reason I find it very interesting is I don’t like A Christmas Story for many of the same reasons. I have to give credit to Evans because he certainly has a specific style using the narration, exaggerated camera movements, tangential plot points, and ominous characters/objects. I give him credit because a lot of people enjoy it; I don’t. The best conclusion I see is that this is a personal preference film. If you enjoy the style of A Christmas Story, you’ll probably like The Sandlot. However, if you are in the minority (based on personal experience) and don’t like the film TBS plays for 24-hours every Christmas, The Sandlot is not for you.